It’s time to change America’s first food. What if white rice helped trigger diabetes and brown rice helped to prevent it, regardless of lifestyle? That’s just what a 2010 Harvard study suggests. Brown rice is a delicious whole food, packed with flavor and with protective nutrients. But all of the sugar-stabilizing fiber and all of the essential fatty acids are stripped out to make polished white rice, along with most of the magnesium, iron, B vitamins, and lignans, and half of the phosphorus and manganese. To make baby food rice cereal, the white rice is even further processed. And this depleted, out-of-balance, processed white flour becomes the eagerly-anticipated first bite of solids for most babies in the US. How we feed babies in those early days matters for years to come. Most core food preferences are learned during critical early windows of opportunity (see Feeding Baby Green). In America we have raised a generation where most children learn to get zero servings of whole grains daily by the time they are 18 to 24 months old. One in three babies born today is expected to develop diabetes in their lifetime, unless something dramatic changes. If we just made the simple switch from white rice to brown rice for babies we might cultivate a taste for whole grains and prevent millions and millions of people from developing diabetes. For that very first bite of solids, though, I prefer choosing something that doesn’t come in a box or jar. Let your baby see a real whole food in its natural state, something she’s seen you eat before, such as a banana or an avocado. Let her handle the whole food. Let her smell it. Let her see you eat some, and then let her see you mash up a bit, perhaps with some breast milk. If you are nursing, she will already have experienced the flavor in your breast milk before. Her strong desire to imitate you and to learn from you, coupled with this powerful combination of seeing, tasting, smelling, and touch creates a profound learning experience that is deeply satisfying and fun. Let a whole food mark this momentous occasion – or a whole grain cereal. But not processed white flour rice cereal. Researchers at the Harvard School of Public Health analyzed rice eating and diabetes in about 200,000 people. Those who ate white rice 5 or more times a week had a 17% increased risk of type 2 diabetes compared with those who ate it less than once a month. Separately, those who ate 2 or more servings of brown rice a week had an 11 % decrease of type 2 diabetes. But the biggest difference came in those who chose brown rice or another whole grain instead of white rice – with up to a 36% reduced risk. If we have a future population of 300 million in the US, with 100 million expected to develop diabetes, a 36% reduced risk represents a huge savings of life, limb, eyesight, money and health. Shortly after babies begin to walk, neophobia begins to set in, the fear of new flavors, textures, or sources of food. Let’s teach a love for whole grains (and other whole foods) while they are still so eager to learn! Sun Q, Spiegelman D, van Dam RM, Holmes MD, Malik VS, Willett WC, and Hu FB. 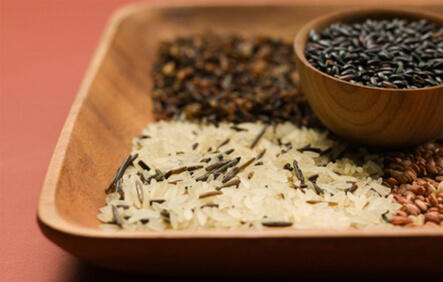 “White Rice, Brown Rice, and Risk of Type 2 Diabetes in US Men and Women. Archives of Internal Medicine. June 2010; 170(11):961-969.